The clock on the DVR strikes 2am as Saturday night slips into Sunday morning. On the TV, Nebraska and Michigan State are in the 4th quarter. The Spartans lead 27 – 3 in a contest that was decided hours earlier. Tommy Armstrong is on the sideline as trainers and medical staff check to see if his internal organs are still in place after suffering a monster hit. Ryker Fyfe is on the field trying to lead the Huskers to double digit holy land. His gangly flailing brings back bad memories of the Huskers’ desperate attempts to score a single touchdown at USC back in 2006. Meanwhile, I’m on the couch scooping out globs of kale and Greek yogurt dip with my bare hands. The chips were gone before halftime. I’m fully aware of the depressing nature of the situation but the need for an activity, no matter how sad, to help stay awake and see this game through to the bitter end outweighs any personal dignity. If Husker Nation could suffer through this deflating, gut punch of a game in real-time, the least I can do experience their pain in a half asleep, zombie fog. Plus, it’s not that bad when you can fast forward through the commercials and Kirk Herbstreit monologues. HAVE I MENTIONED YET THAT I HAVE ABSOLUTELY NO IDEA HOW THIS GAME IS GOING TO END? Thanks to the collision of my two favorite teams, Saturday was a day that started with nervous stress and would end in either anguish or joy. There would be no middle ground if either the Huskers or Dodgers lost. In our 10th season of going to Dodger games together, my wife and I have our system dialed in. Every little detail down to our seats being in the shade by exactly one row has been honed and refined to an Ocean’s 11 level of precision. It takes between 35 and 50 minutes to get from our driveway to our seats. With kickoff an hour and a half before the first pitch, my only chance to watch the Huskers in real-time was to make sure we arrived at Dodger Stadium extra early. Throughout the day, I badgered her with every possible angle- watch BP, snag a seat over the bullpen to see Zack Greinke warm up, grab a slice of pizza at Tommy Lasorda’s. Eventually, ( I think it was the combination of a Rain Man like insistence that we go directly to our seats and pulling out an iPad and a pair of giant headphones the moment we sat down) she caught on to my real motive and left me in peace to scream to my heart’s content in a nearly empty stadium. By the time I looked up from the screen, it was halftime. 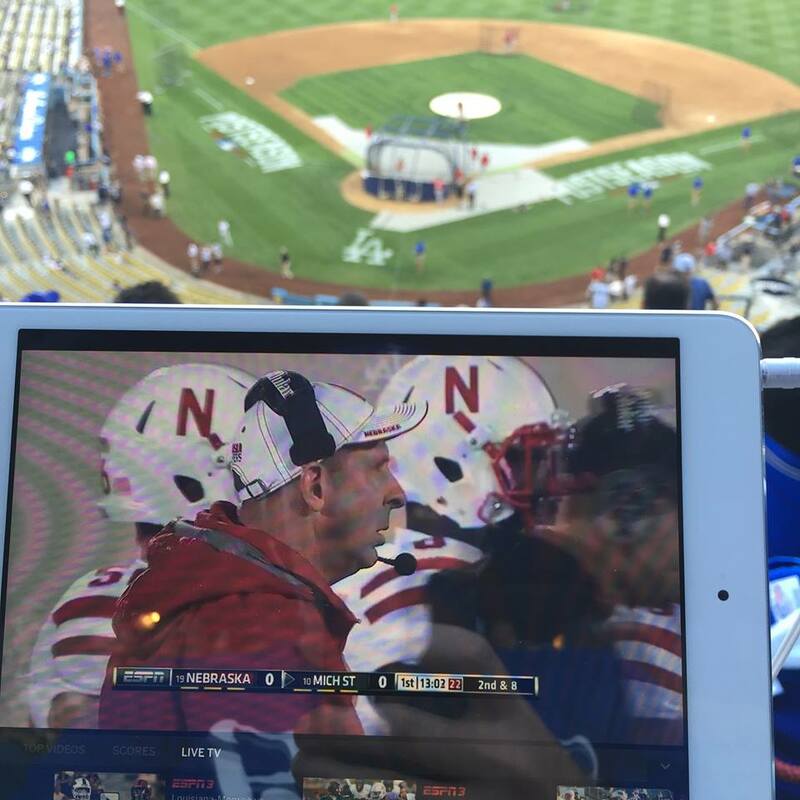 The Huskers were down 17 – 0 in the most brutal way possible and Dodger Stadium was suddenly filled to capacity. 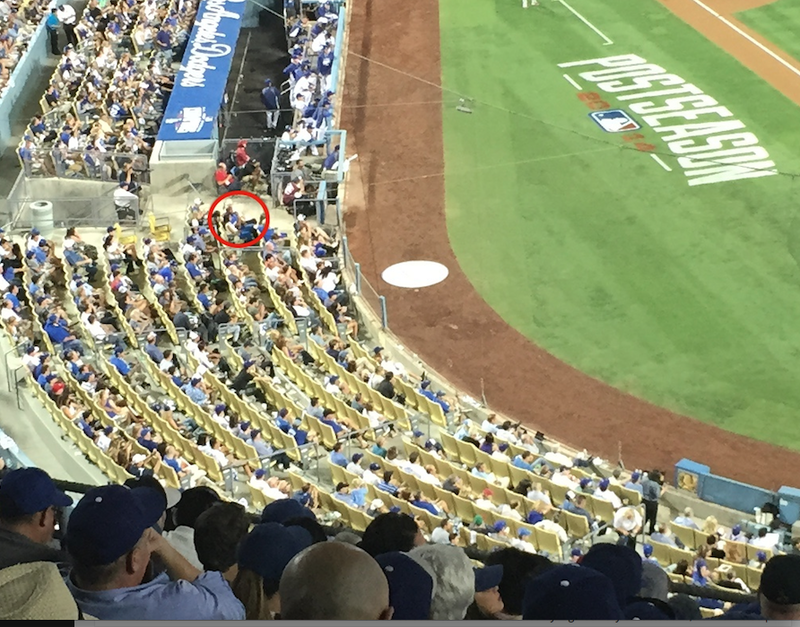 The surreal nature of not noticing 55,000 people chanting “Let’s go Dodgers!” made me realize just how deep I was buried in my mental Husker bunker. Without giving it a second thought, I ripped off the digital Band-Aid and put all the gadgets away and vowed to go off the grid until I watched the second half play out at home. It was going to hurt but the only way to enjoy the Dodger game was to try and forget about the Huskers. With Friday’s implosion still a gushing head wound, the game started off tense. The stadium breathed a sigh of relief when the Dodgers jumped out to an early 2 – 0 lead thanks to pitcher Zack Greinke helping his own cause and A.J. Ellis bumping his postseason batting average to .833. During lulls in the action, I’d compulsively check my phone but pump the brakes before unlocking the screen. By the 5th inning, unread texts outnumbered the Spartans’ score at halftime. Never a good sign. Things got so desperate at times I’d even look down towards Magic Johnson to see if I could pick up a clue from his body language. If Magic cheered between innings, there would be no doubt the Huskers were doomed. He never did. The Dodgers’ two run lead would stand until the 8th inning when Greinke relinquished the mound to the normally reliable J.P. Howell who promptly gave up a moonshot of a game tying home run. If the St. Louis Cardinals were a college football team, they’d be a mix of a Oklahoma and Texas- an unholy blend of Sooner Magic and Longhorn arrogance. When they eventually sink in that dagger, they will have shanked you the Cardinal Way. Thanks Matt Kemp’s heroic bomb in the bottom of the 8th, the Dodgers quickly regained the lead and closer Kenley Jansen slammed the door shut in the 9th. For one night at least, the Cardinal Way could go kick rocks. Driving home, post game elation started to give way to inevitable dread somewhere around Korea Town. The feeling was like savoring the last bites of a lobster knowing your next stop is the electric chair. “Jill and Holly both texted about that,” was her solemn reply. Jill and Holly are her die-hard LSU fan BFFs. If they were checking me, things did not end well. I settled in on the couch and started from the very beginning. Watching the first half a second time didn’t hurt any less and opened the door for so much second guessing. Punting from Michigan State’s 30 yard line? Why not give Imani Cross a couple carries just to give the Spartans a different sized body to tackle? Will Jake Cotton ever live down being toppled by a ghost? Doesn’t Tim Beck realize plays out of the wildcat often end in disaster? As Bo Pelini’s teams have shown, being down 17 points isn’t much of a deficit so maybe the second half would be all Nebraska. That optimism lasted until the Spartans went up 20 – 0. The game still wasn’t technically out of reach but fumbles and stalled drives started to really hurt. The Blackshirts do a good job of keeping Michigan State out of the end zone, for the most part, further delaying the surely inevitable outcome. The clock ticks under 5 minutes. The scoreboard has long been frozen at 27 – 9 and Spartan Stadium begins to empty out. The temptation to turn off the TV has never been greater but the Huskers are knocking the door of their second TD of the night. A defensive holding penalty and two rushes by Abdullah later, the score is now 27 – 16. 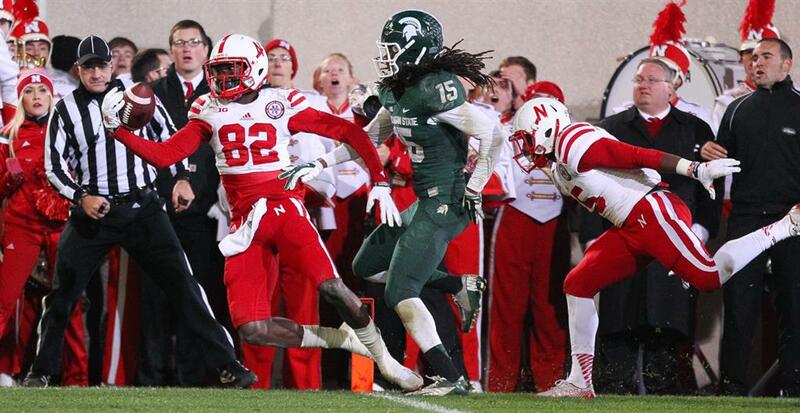 When Michigan State got the ball back, it took a minute for Chris Fowler and Kirk Herbstreit to realize the Huskers were still in it to win it. They’d punched out on paying attention to the game long before the 4th quarter even started so it came as a shock to see Pelini on the sidelines calling timeouts with teeth gnashing fire. By the time they finished their calculations and realized there was still chance, no matter how remote, that Huskers could come back, Faux Pelini’s new best friend had already punted the ball away to De’Mornay Pierson-El who promptly took it to the house, bringing Nebraska within five points. If barehanded dip eating was the lowest part of the game, screaming into a throw pillow was the absolute zenith. The Huskers were suddenly looking down the barrel of their greatest comeback ever. A 36 yard MSU field goal attempt getting blocked by the goalpost confirmed this to be true. It was going to happen. It had to. Four plays later, the game was over. A Michigan State interception sealed their victory after dodging sure death the play before. Alonzo Moore gave it everything he could to haul in what could have been the game winner for the Huskers. After the final whistle, I immediately re-watched the last five minutes just to make sure I wasn’t hallucinating. What I saw the second time around was a Husker team that refused to quit. There would have been no shame if Tommy Armstrong chose to call it a night but he was out there with his team fighting until the very end, throwing lasers when it mattered the most. Seldom used reserves were stepping up in place of injured teammates and a true freshman added to his quickly growing lore with the most exciting play of the night. While Bo Pelini will tell you he doesn’t believe in moral victories, the fact his team never stopped believing is a huge testament to their drive and character. For 55 minutes they were getting knocked down and pushed around by both luck and the Spartans but they finally found a way to put themselves in a position to win at the every end. And that’s all you can ask for. There is no reason to be ashamed of this loss. * When I woke up the next afternoon, (the finish left me so wired I had to read about the game until the sun came up back in Nebraska) I found out I wasn’t the only one who went cold turkey at halftime.